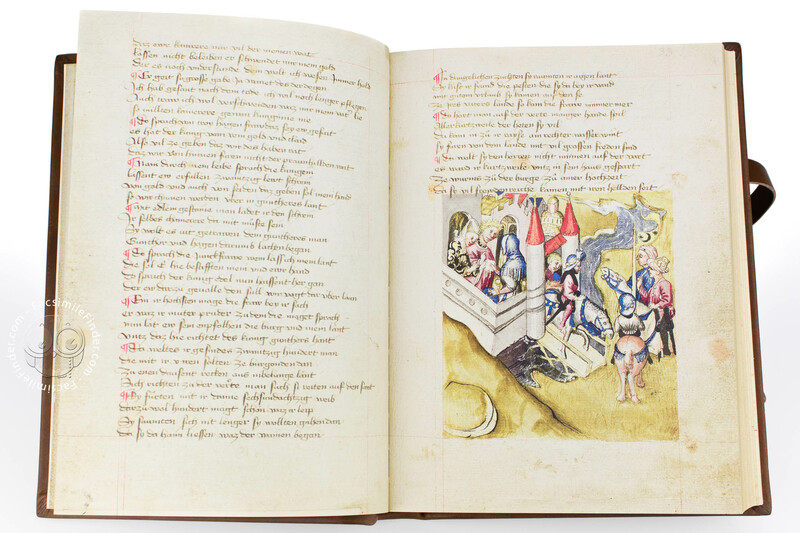 The Nibelungenlied, or Song of the Nibelungs, is regarded as the national epic of Germany. That is both correct and incorrect. Correct, because since the nineteenth century every child in Germany has been familiar – at least in outline – with what this mediaeval epic poem is about: it tells the story of Siegfried, the dragon-slayer, who first helps King Gunther of Burgundy to bring his bride back home, for which he is rewarded with the hand of the beautiful Kriemhild. But in his triumph lies the germ of a great misfortune: Siegfried is murdered, and the people of Burgundy are defeated at the court of King Etzel. In this part of the Nibelungenlied, incidentally, the action leaves "German" territory: the Burgundians travel down the Danube from Passau until they reach Ofen (Budapest). And, in fact, it was only during the eighteenth and nineteenth centuries that the Nibelungenlied became a national myth: during the Middle Ages the synopsis of various Nordic sagas and real historical events from the times of the Migration Period and the Kingdom of the Merovingians was much less popular as a subject than, for example, Dante's Divina Commedia, Chaucer's Canterbury Tales or the French Roman de la Rose. It was during the first flowering of German studies coinciding with the era of growing national awareness that the archaic-mythical quality of the text was discovered and became rooted in the German collective consciousness. In about 1200 the essence of the two ancient sagas telling of Siegfried and the Burgundians were transformed into a powerful epic and written down in Middle High German verse. The author and the original version remain unknown. 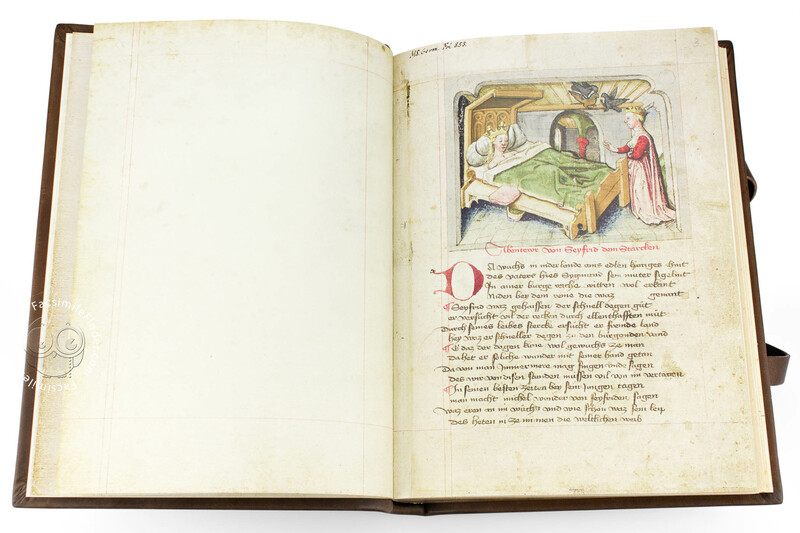 Only a handful of manuscripts without illustrations have survived from these early times. The only illuminated manuscript of the saga to have survived dates from the fifteenth century. 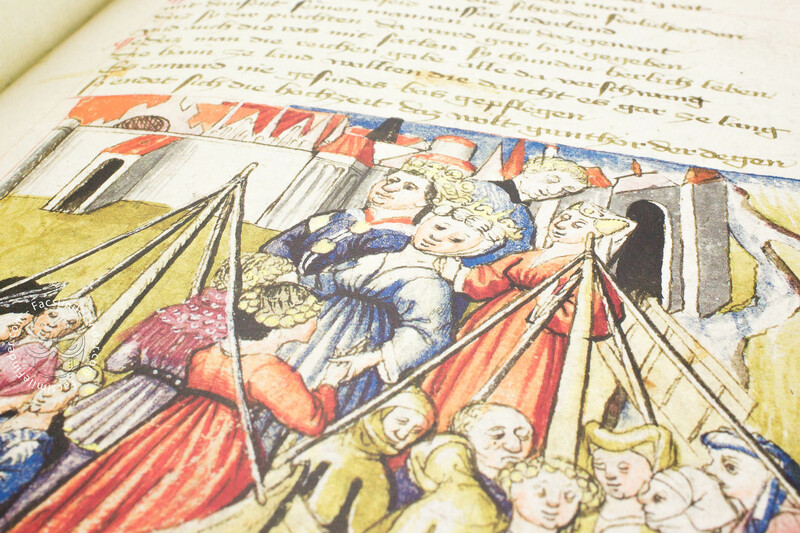 It is known as the Hundeshagen Codex and is in the possession of the Berlin State Library. It is named after the Wiesbaden librarian Helfrich Bernhard Hundeshagen, who is said to have discovered the manuscript in 1816 in an antiquarian bookshop in Mainz. Since he never explained the full circumstances of his discovery, to this day very little is known about the provenance of the manuscript. 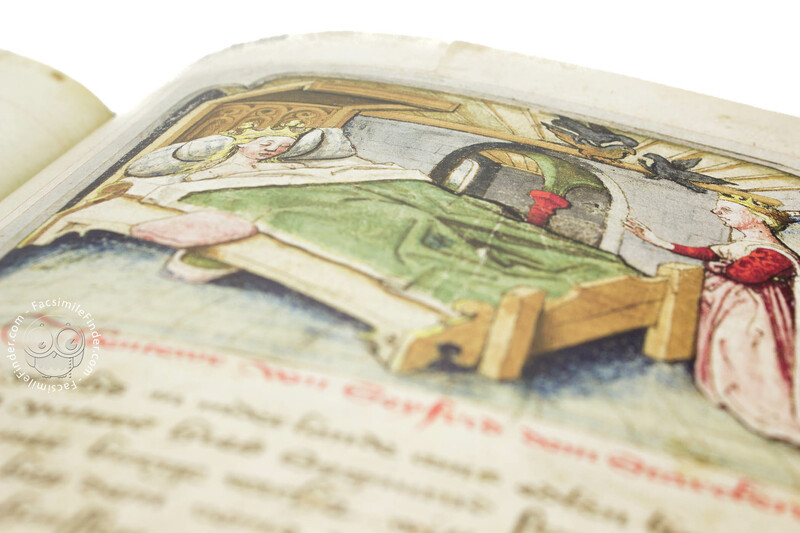 One outstanding feature of the Hundeshagen manuscript lies in the 37 magnificent and exceptionally well-preserved pictures. This means that the manuscript is the only one with a full series of illustrations. That is the reason why we have selected the Hundeshagen Codex to produce a long-overdue facsimile of this, the "German's own book". The pictures correspond with the preferred style of the Late Middle Ages: ink drawings with a wash, executed with a sure hand and at times a meticulous delight in detail. There is no gold as in the magnificent manuscripts of the Middle Ages: with the paradigm shift to secular manuscripts and the increased demand for books, the latter had become less elaborate but no less colourful. 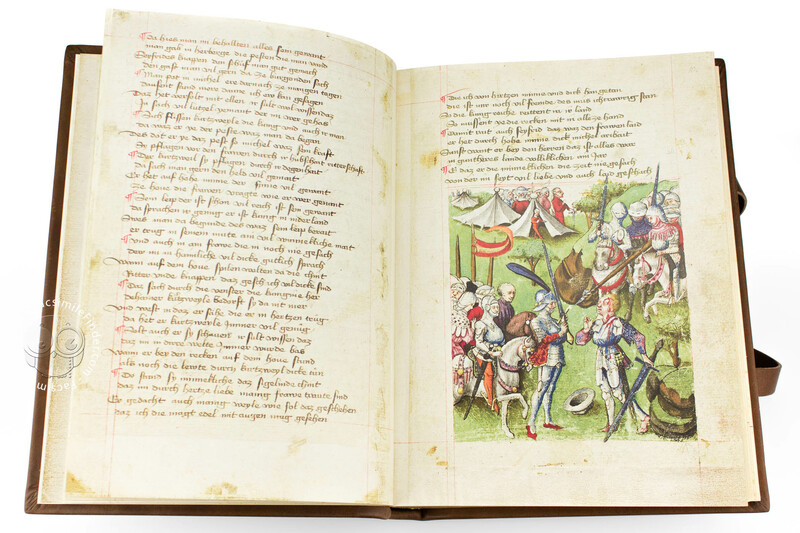 The pictures fascinate the reader and permit him or her to participate in courtly and chivalric events such as banquets, tournaments, hunts and journeys on horseback or by ship. They even offer glimpses inside the royal bedchamber. The Nibelungenlied has been handed down in two versions, which are known as the "Not version" and the "Lied version" according to the final words of the manuscript concerned in each case ("daz ist der Nibelunge not" [That is the tragedy of the Nibelungs] – "daz ist der Nibelunge liet" [That is the song of the Nibelungs]). A further unusual feature of this manuscript is the fact that here the two versions are combined. Apart from the Hundeshagen manuscript, only one other complete manuscript demonstrates this approach to the saga. 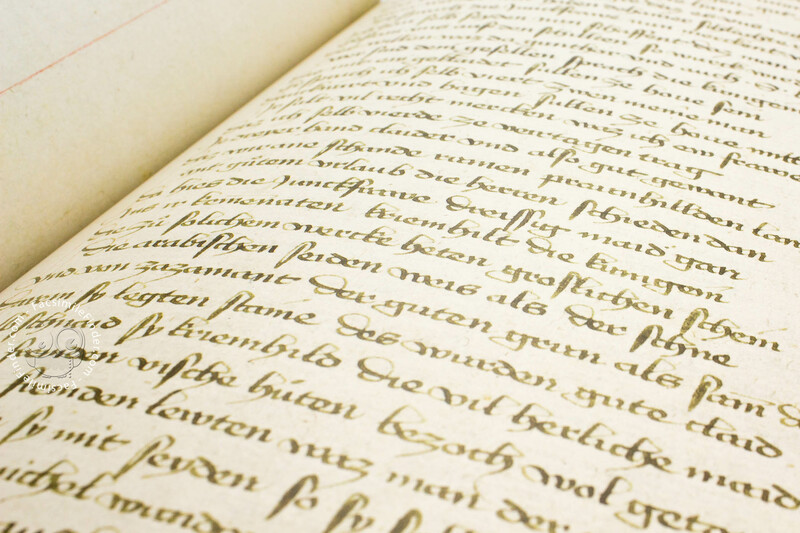 Manuscript book on parchment − 28.2 × 20.5 cm − 384 pp. 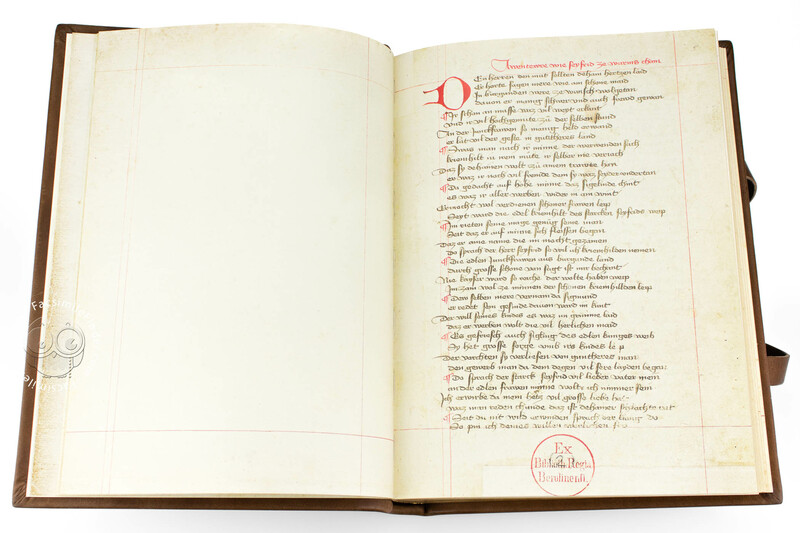 Full-size color reproduction of the entire original document, Nibelungenlied: the facsimile attempts to replicate the look-and-feel and physical features of the original document; pages are trimmed according to the original format; the binding might not be consistent with the current document binding. Reconstructed on the basis of an original fragment with a wood cover encased in finest brown cowhide. Blind embossing on the front and back as well as on the spine, with five brass studs, two catches with straps and gilt edging on three sides.